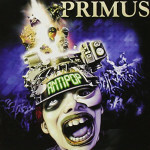 (Interscope) Primus is one of those bands that you compare other bands too. If you haven’t heard of Primus and the insane bass and distinct vocals of Les Claypool, then go back to the beginning of the game and do not collect $200. “Antipop” is more of the good stuff that one expects from Primus. They are helped out on a few of the songs by guest producers which include Stewart Copeland of the Police, Matt Stone of Southpark fame and the great Tom Waits. My favorites on this disk include Laquer Head (Ranks right up there with Tommy the Cat, My Name is Mud and Jerry was a Race Car Driver), The Antipop, Eclectic Electric, very Ballad of Bodacious (Red Hot Chili Pepper Funk-N-Groove) and the Nick Cave sounding Coattails of a Dead Man, which sounds like a song that Tom Waits would have left over from his “The Black Rider” CD.